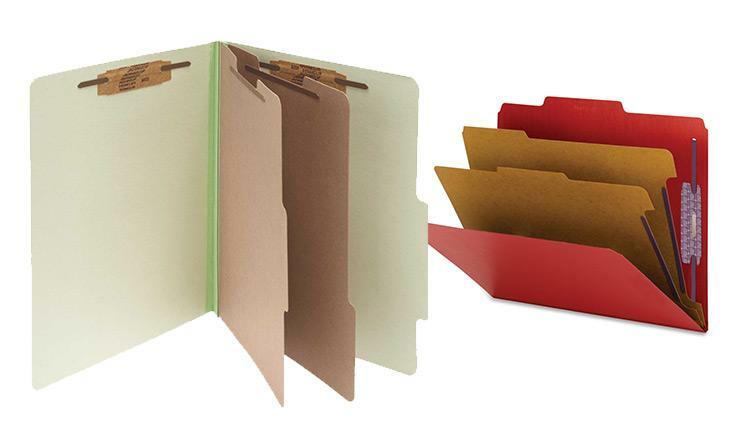 Speed up your filing process with FSS's colored classification and fastener pressboard folders. Use red for “hot” files and green for invoices that need to be paid. Our durable pressboard folders resist wear and tear while the accordion-pleat gusset and match tape expand to hold up to 1" of materials. Find critical files fast with FSS’s top tab classification folders. Get nearly double the labeling area of a standard classification folder, so you can write bigger or use more lines of description. Protect your documents and fingers with our patented coated fastener technology, the ultimate solution to fastener issues including paper tears, finger cuts and excessive fastener crinkling. Two dividers provide six filing surfaces for ultimate organization. The sturdy gusset expands to hold up to 2" of material. Find critical files fast with FSS’s pressboard fastener folders. Get nearly double the labeling area of a standard fastener folder, so you can write larger or use more lines of description. 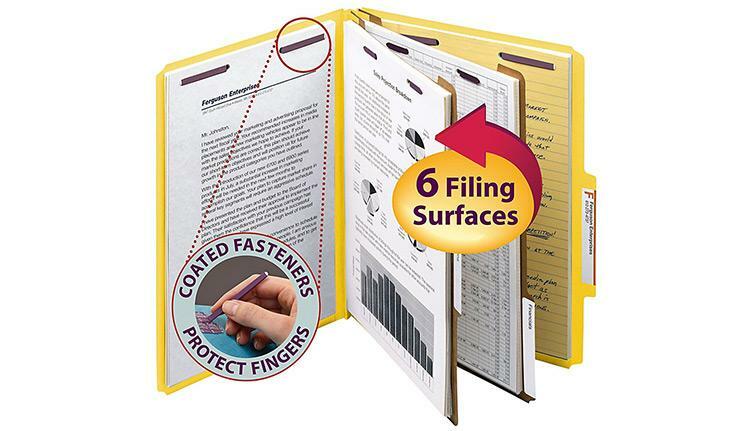 Protect your documents and fingers with our patent pending coated fastener technology, the ultimate solution to fastener issues, including paper tears, finger cuts, and excessive fastener crinkling. The sturdy gusset expands to hold up to 2” of material and is made from heavy-duty pressboard material to handle large, bulky files that get plenty of use.